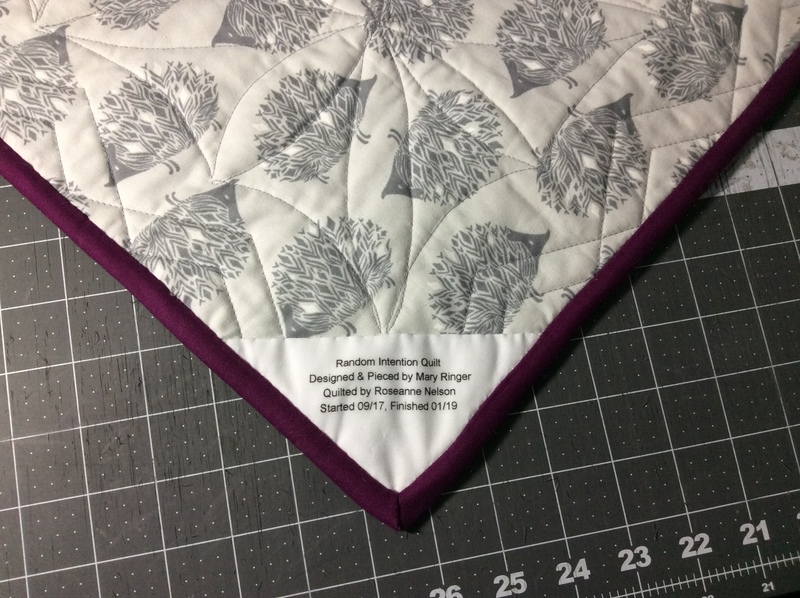 It is my turn to be the March Queen Bee for our IG HoneyBees 2019 swarm, and I’ve chosen the Treasure Hunt block by Alyce@ Blossom Heart Quilts. 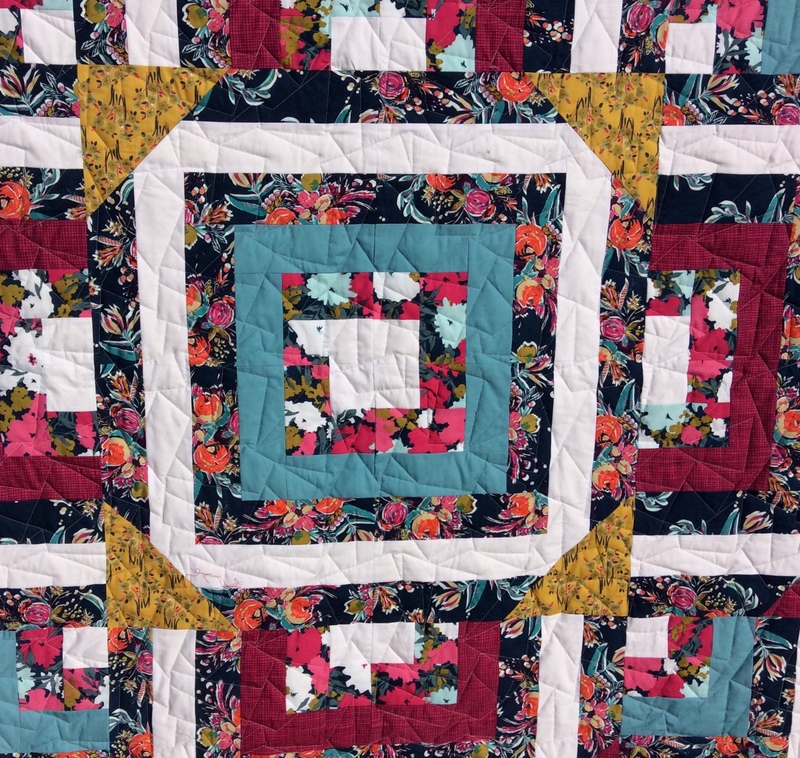 I’ve loved this block since Ophelie chose it for her Stash Bee hive members to make blocks that she used to make a comfort quilt for her terminally ill father in 2017. 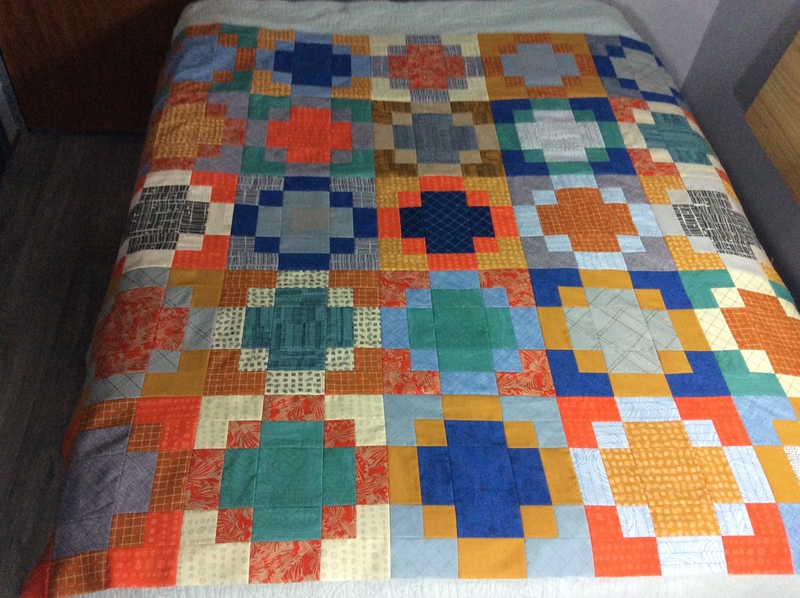 Please take a look at her Stash Bee post, read her story and see photos of her beautiful quilt. 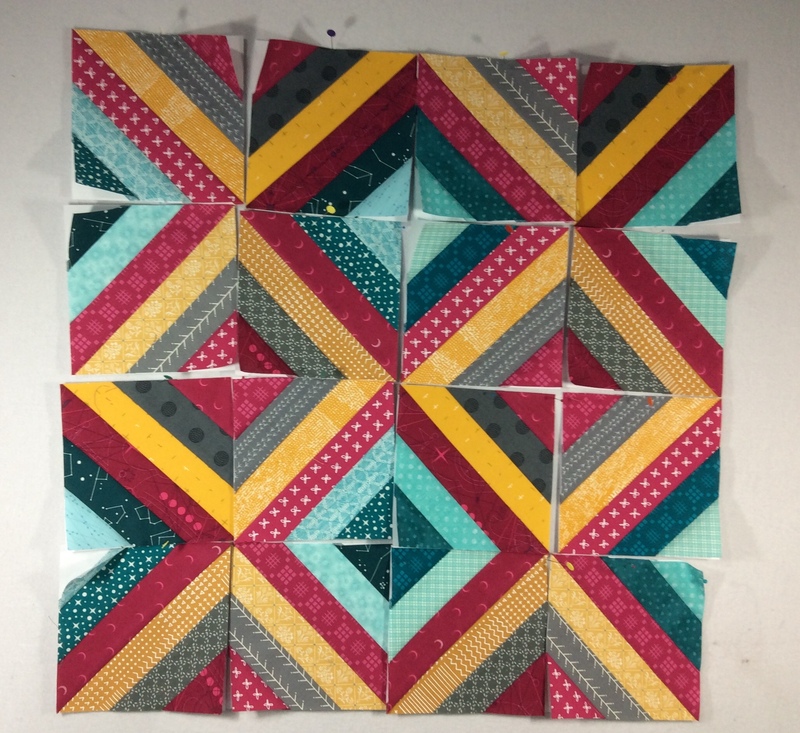 This is a fairly simple paper-pieced block. The colors that I have chosen are dark pink, medium or dark grey, mustard, teal, and aqua. 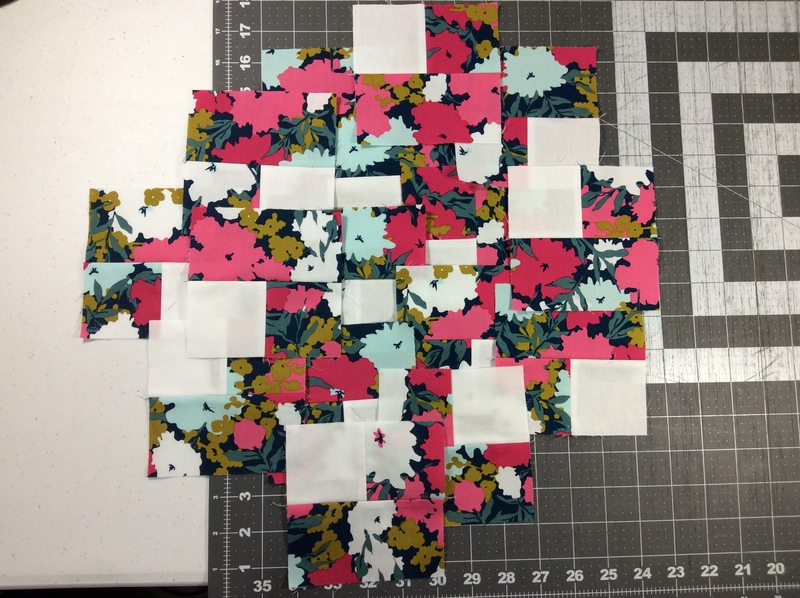 Below is a photo that shows four sections for a block that have not been sewn together. The reason that they are not sewn together is that I also don’t want my swarm members to sew their blocks together either. 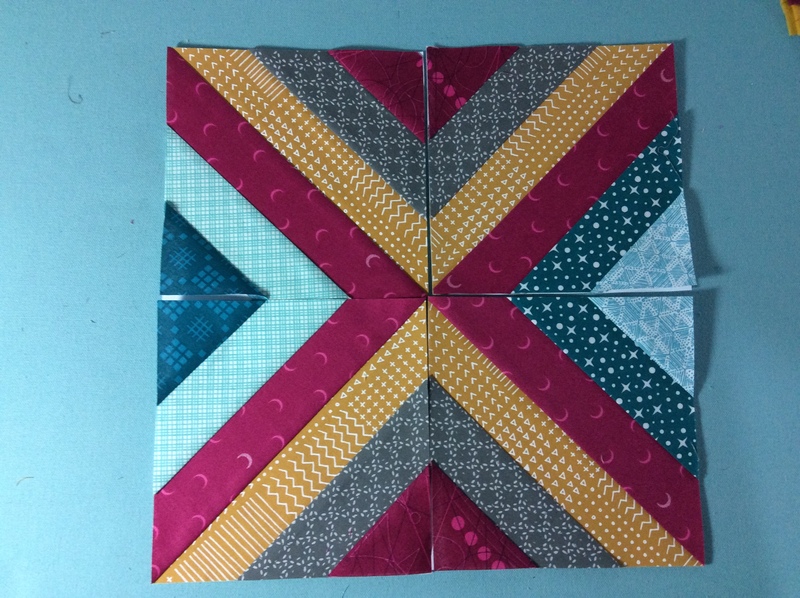 I would like my swarm members to send me the four sections of their blocks, and then I will create a scrappy quilt by making blocks out of different people’s 6 1/2” sections. Each section is divided into six segments. I’ve made a choice to have two dark pink segments and would prefer two different dark pink fabrics be used in the block to increase the scrappy factor. So far I have paper-pieced a total of 16 sections. 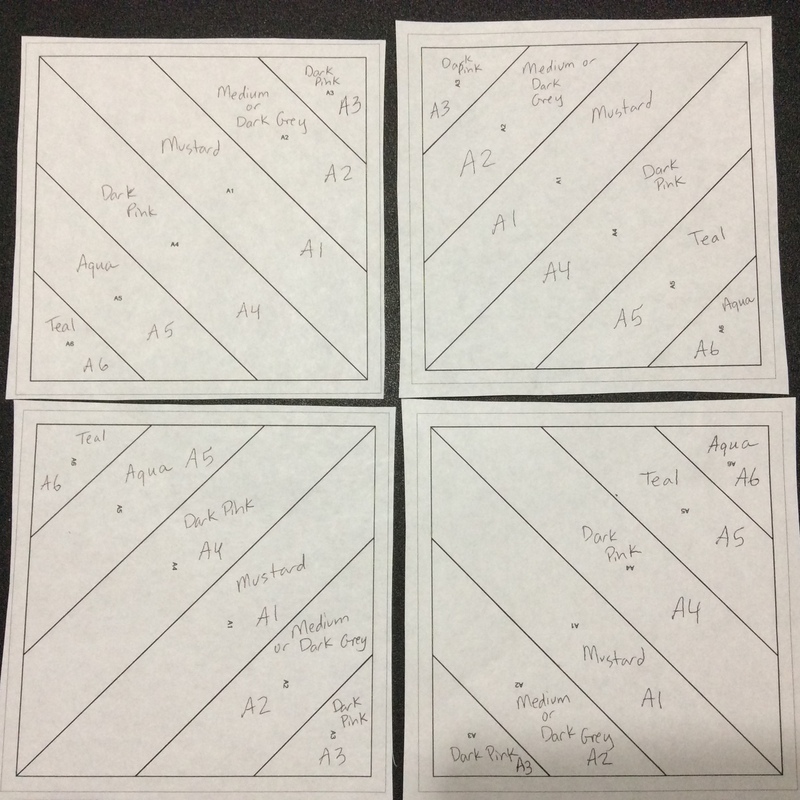 Below is a pic of the sections mixed up to form four scrappy blocks. The alternating teal and aqua diamonds are created by alternating the teal and aqua colors in the A5 and A6 sections. When the pattern template is downloaded, there are directions on how big to cut strips for each segment. I think the 2 1/4” width works fine for segments A1, A2, A4, and A5, but I recommend cutting the strips for the A3 and the A6 segments a little wider. I found that 2 1/2” strips for A3 and A6 worked better for me. You can always use wider widths and longer lengths of fabric than what is suggested because the extra fabric will be trimmed off. An inexpensive metal ruler to fold the paper is extremely useful. I would not even attempt to paper piece without this Add-A-Quarter Ruler. 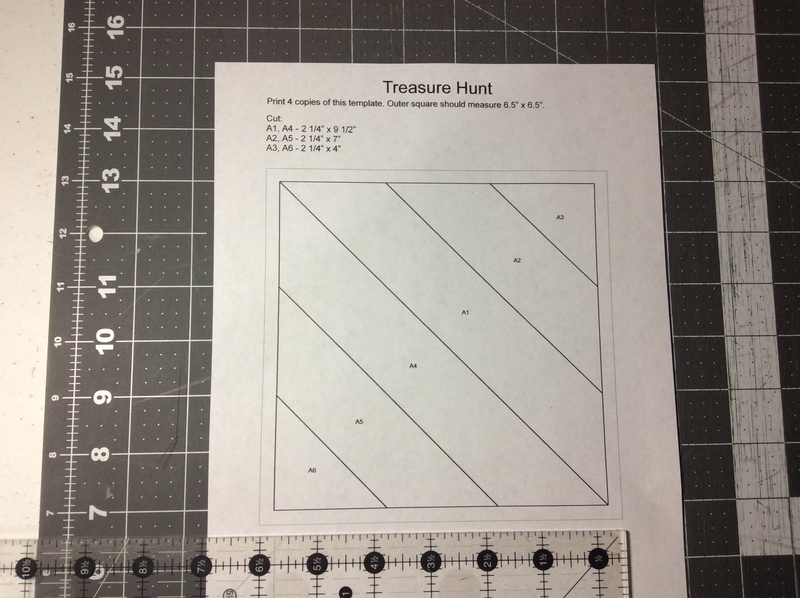 I have found that the Treasure Hunt templates that I printed from my iPad were undersized, but the ones I printed from my laptop where I can scale the printing at 100% were the correct size. The templates should be exactly 6 1/2” which includes the seam allowance. I’m really looking forward to getting happy mail this month and hopefully turning these scrappy blocks into a finished quilt this summer. My February ‘19 One Monthly Goal was to finish the quilt top for the 52” x 52” quilt I am making to commemorate my friend, Kristen’s fantastic accomplishment in getting her Master’s in Social Work in May (while working full-time and being a single mom who is doing an awesome job of raising her 10-year-old son). 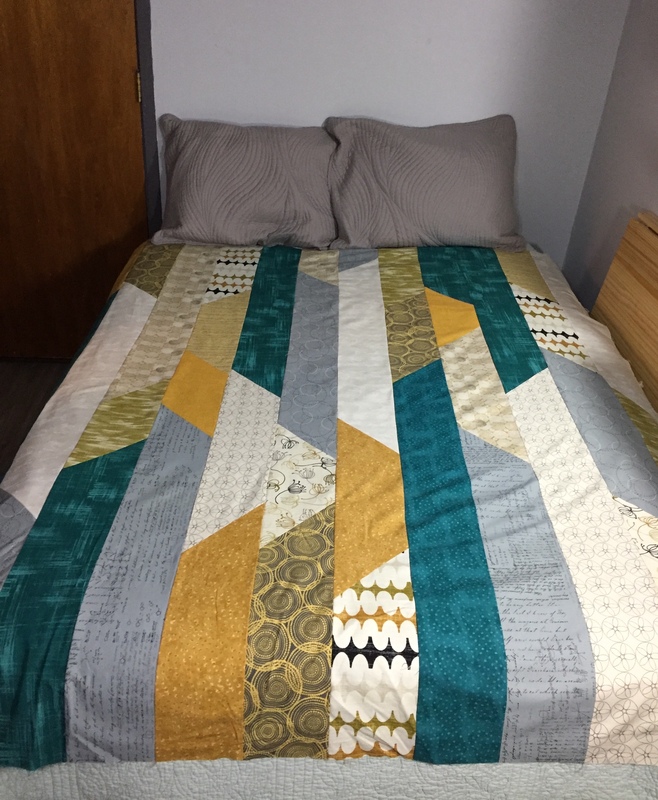 Read on for more details, but cutting to the chase, today I am able to share a finished quilt instead of just a finished flimsy. Kristen is a kind and loving young woman, but she also has an edgy side that she totally embraces. I’ll give you an example. 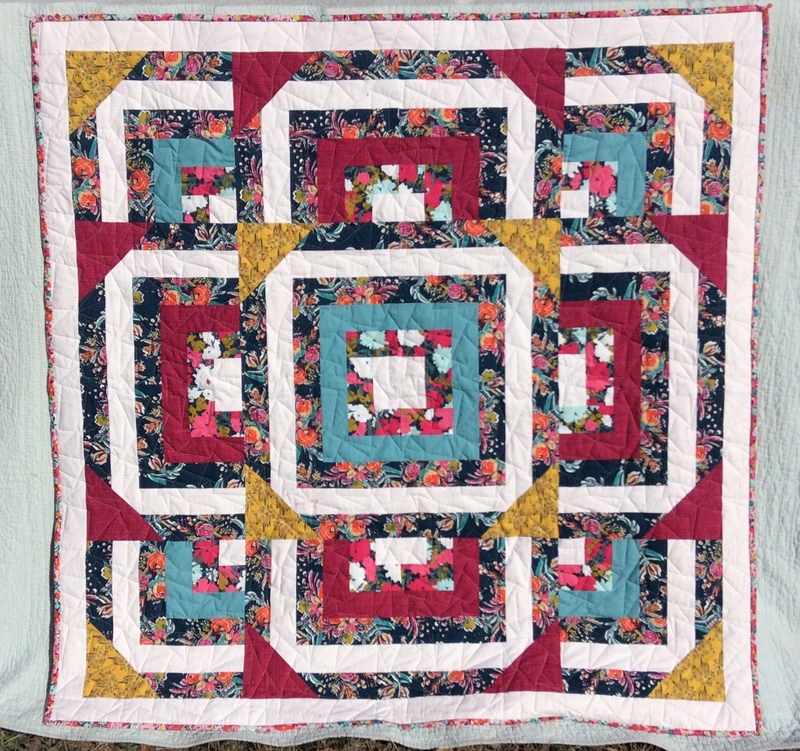 Back in 2015 when we were working together, I told her that I was thinking of starting to write a blog called Quilting is in my Blood to chronicle my quilting journey but also in homage to my mother who was an avid quilter. Kristen loved that the name of my blog honored my mom, but she also liked that it had the word “blood” in it for its edgy factor. The flimsy went together quickly, especially as I was able to use my AccuQuilt strip cutter to cut all the 2 1/2” strips that were subcut into different lengths for the 16 log cabin-esque blocks used to make this quilt top. I was able to send it off to Amy Ellis of Amy’s Creative Side to quilt it for me on 2/11/19 and received it back from her on 2/19/19. Amy occasionally offers long-arm quilting at a very good price. I’ve sent two quilt tops to her, and I’ve been so pleased by how quickly she returns the quilts as well as her quality craftsmanship. 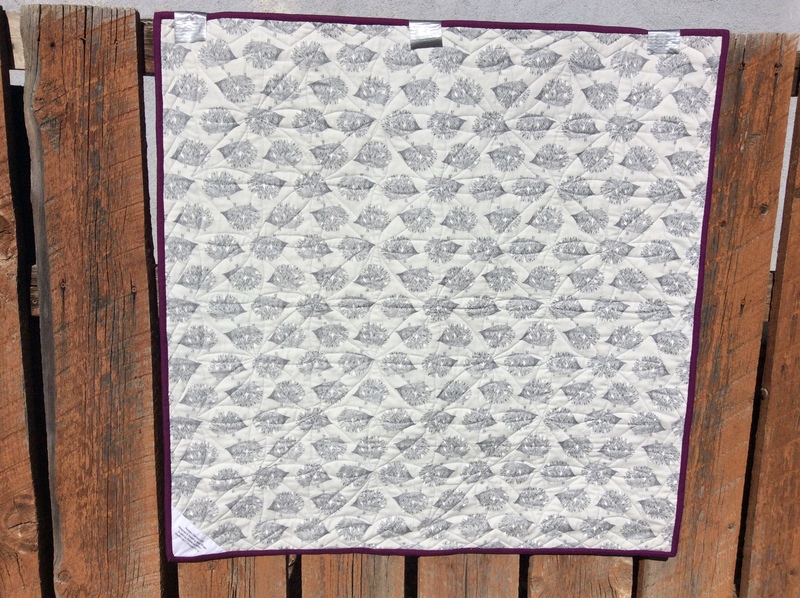 Below is a close-up of the quilt which shows the “edgy” element to this quilt: the “Broken Glass” quilting pantograph. This the first time I’ve made an entire quilt from Art Gallery Fabrics. 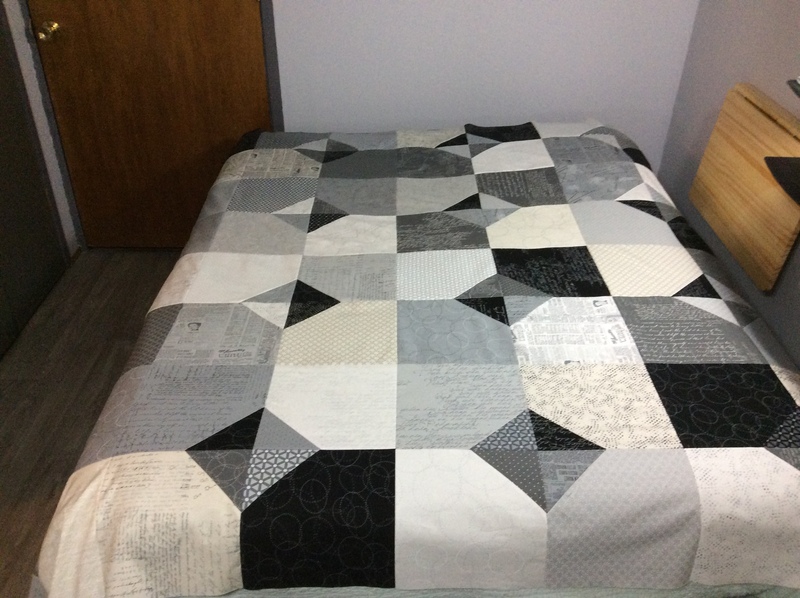 Their slogan is “Feel the Difference,” and I have to say it is the softest quilt I’ve ever made. 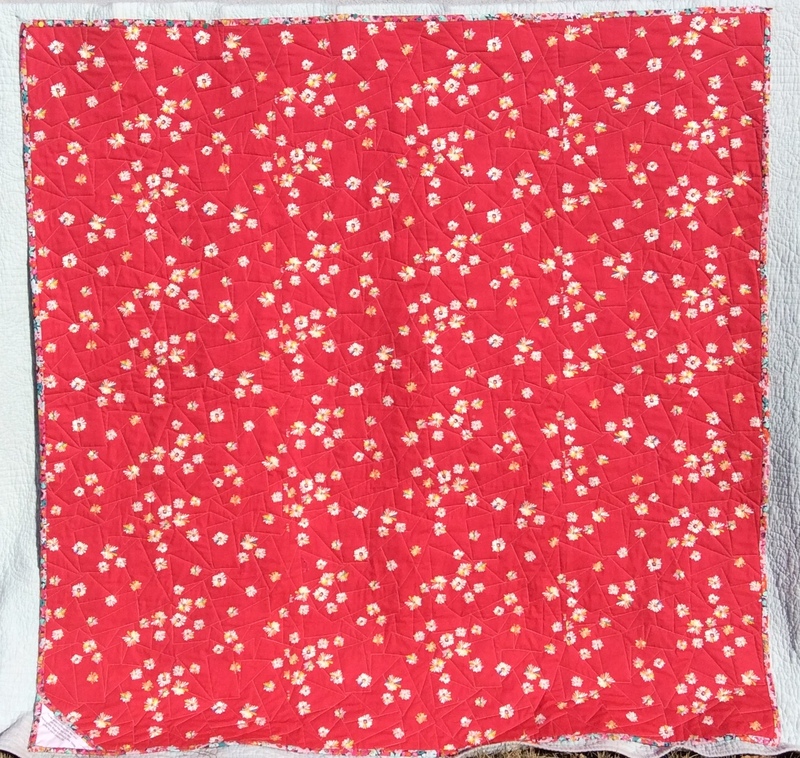 Below is a photo of the back of the quilt featuring the scrumptious Hazy Daisies in Scarlet fabric. I finished binding this quilt last evening and was so pleased to wake up today to a sunny morning, so I could take the quilt outside to photograph. I was going to duct tape the quilt to my side fence, but I was afraid the fence might be slightly moist from a dusting of snow yesterday and even more concerned that the fence might be dirty since the quilt has a fair amount of white fabric. I wiped the fence with a paper towel, and it was filthy! So I went with Plan B. I grabbed the old aqua comforter that goes underneath whatever quilt is on my bed, hung it over the fence, and then pinned the quilt to the comforter. I have to say Plan B worked pretty well since I got it photographed in 20 minutes and didn’t even have to leave my yard! Of course the aqua comforter went straight into the washer when I was done! I’ve decided to call this quilt, Commemoration. 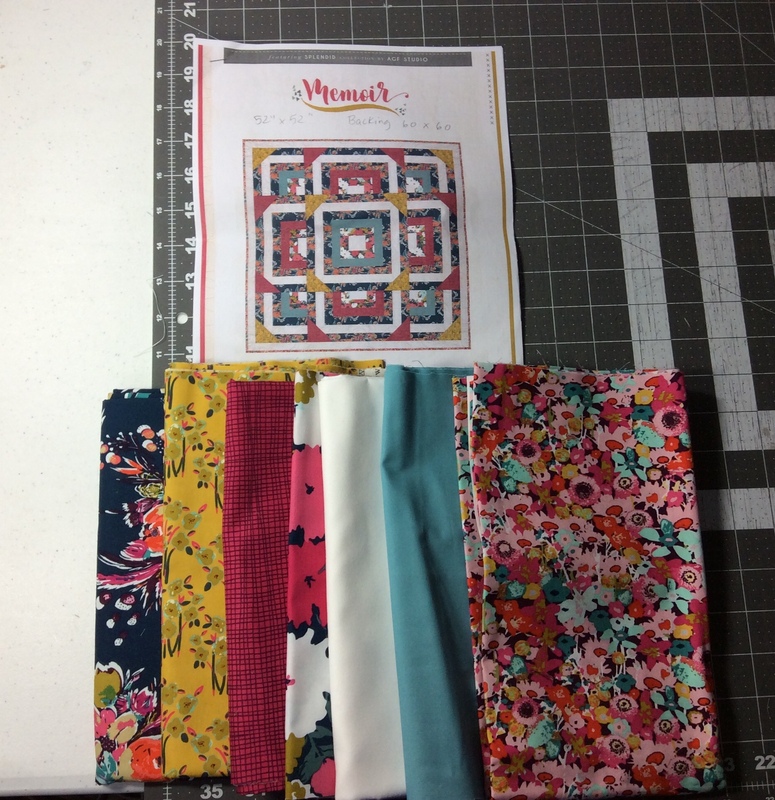 See my Feb ‘19 OMG post for information about the pattern and fabrics used in this quilt. 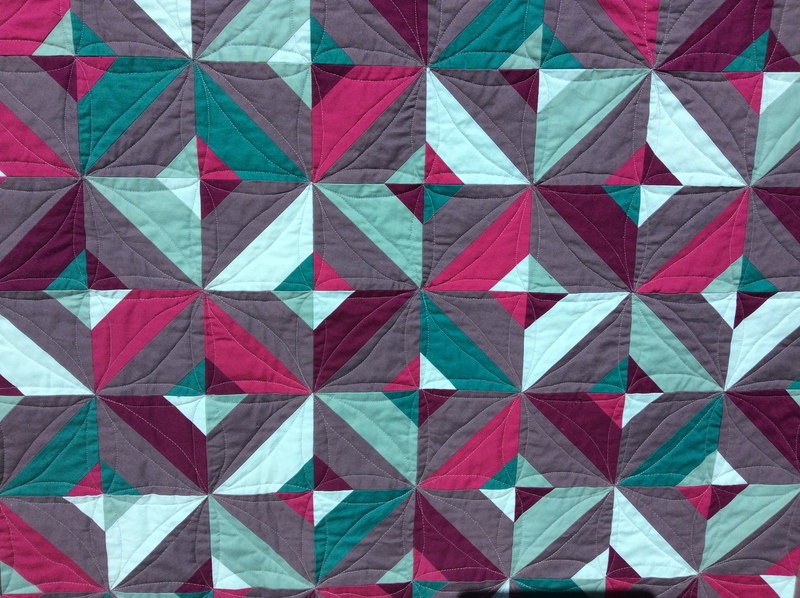 Linking up to Elm Street Quilts: Feb ‘19 OMG Finishes. This was my “iffiest” 2019 Qtr 1 Finish-A-Long Goals, but I’m so glad I got it done in plenty of time for Kristen’s graduation. Linking up to 2019 Qtr 1 Finish-A-Long Finishes. 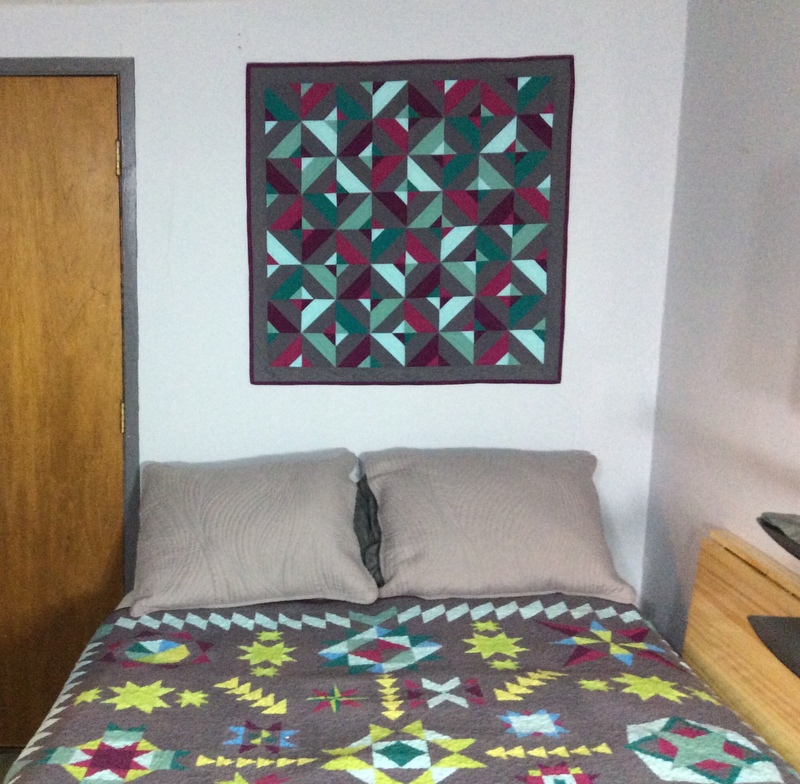 One of my 2019 Quilting Goals was to make a gender-neutral quilt top to donate to Quilts for Delhi, but a week or so ago I remembered that I had made a quilt top in 2017 that definitely is not “girly.” I was going to use it to practice my quilting skills. 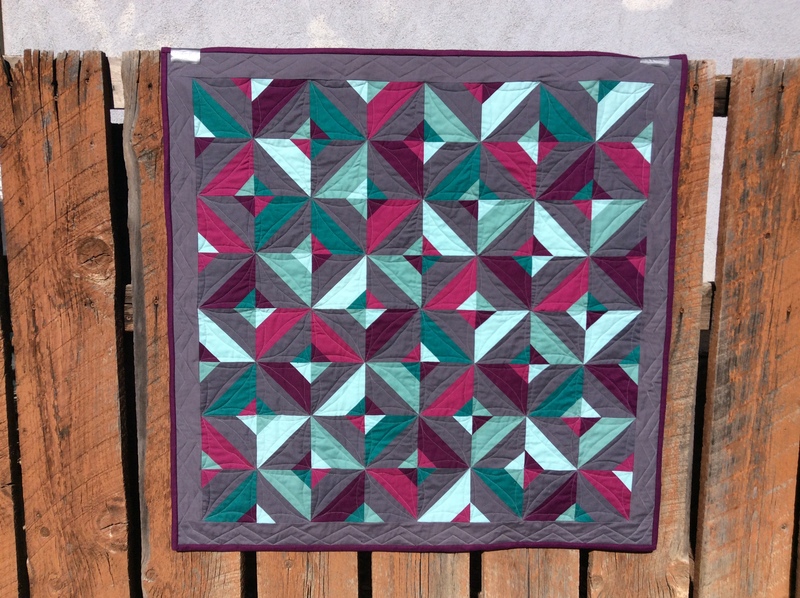 Well, I’m not saying that I’m never going to quilt a project that is bigger than a baby quilt, but I much prefer piecing quilts, and I’m itching to do more quilt design when I get EQ8 in a couple months. So, I was happy to send off this quilt top today to Katie (@katikat21 on Instagram). The pattern is Forest Daybreak by Brenda Ratliff, and it is described as a “great beginner improv project”. It was featured in the May/June 2017 issue of Modern Patchwork, but a PDF pattern is now available for purchase and immediate download. Linking up to My Quilt Infatuation: Needle and Thread Thursday.